Does Honey Work as an Antibiotic? The health benefits and healing properties of raw honey were documented thousands of years ago by ancient Greek, Roman, Islamic and Vedic people. Aristotle and Hippocrates commonly referred to honey’s use as a medicinal aid. However, it was not until recently that scientists gained more information as to why honey contains antimicrobial properties and how it can benefit Rhode Island live-in caregivers and the seniors they look after. Fresh or raw honey contains amino and organic acids, which include acetic, butyric, citric, formic, gluconic and lactic acids. These compounds give the sweet substance a pH level of somewhere between 3.2 and 4.5. This acidity alone inhibits bacterial growth. However, scientists from Sweden’s Lund University determined that 13 types of lactic acid bacteria in unprocessed honey are one of the major keys behind the substance’s ability to fight infection. When honey containing lactic acid bacteria or LAB was applied to the persistent wounds of horses, the natural compound surprisingly promoted healing. Previously, horse owners exhausted numerous medical interventions in an effort to heal various types of skin wounds. All of the techniques failed. In laboratory tests, the bacteria were evaluated for their ability to fight pathogens found in human skin infections. LAB successfully overcame methicillin-resistant Staphylococcus aureus, which is often referred to as MRSA. Tests also showed similar results when the bacteria were used against Pseudomonas aeruginosa, vancomycin-resistant Enterococcus and other bacterial strains. Scientists theorize that the broad-spectrum abilities of fresh honey involve the possibility that the LAB organisms are capable of producing compounds in different situations as needed to defeat individual pathogens. On the other hand, manmade antibiotics are typically manufactured to combat infections caused by a narrow selection of bacteria. The Swedish researchers plan to continue studying LAB in an attempt to learn more about the organism’s infection fighting abilities. The recent findings offer hope in the fight against resistant bacteria in the modern world. 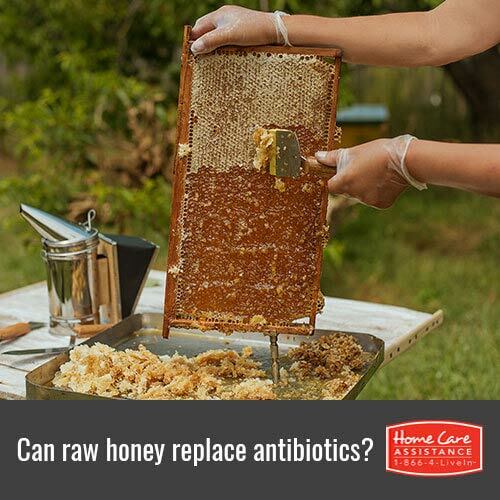 In addition, as raw honey is typically available in less developed countries, the bacteria offers a means of providing basic but beneficial medical intervention. Because seniors are more susceptible to bacteria, it’s important for Rhode Island home care providers to stay up-to-date on the latest research on antibiotics. Home Care Assistance of Rhode Island is a trusted provider of at-home senior care that enables seniors to live healthfully in the comfort of home while managing illness and injury. Let us help your loved one achieve overall wellbeing during the golden years. Call (401) 284-0979 to schedule a free in-home consultation today. What Are 6 Common Causes of Bad Breath?